Learning English for non-English speaking students is generally a difficult task to achieve and this is the place where the importance of a good English educator increases. It requires patience, diligence and lot of love to be shared with the students. For the Students, it is not just learning about the language but experiencing a whole new culture with the help of the language. For an Educator, it is not just teaching the language but they require to gain additional knowledge of the students cultural background and sometimes require to customize teaching methods for the students. The following mentioned are few easy English speaking tips for people who want to learn or improve English speaking conversation. It is a common thing that in a class few students are able to learn faster than others and few take time to learn. Therefore, creating a buddy system where two to three students are partnered together to study. They could be from a same cultural background or someone who has the patience to help their friends. This will encourage the students to learn English and teach among themselves. Using visual cues to teach is quite easier for the students to understand something. It helps them to know what is the translation of the same in the English language means. Visual pictures are the universal thing in the world and are generally same everywhere. For Example, if you want to teach about English name of the animals then it is effective to use the pictures of the same as for the students it will be easy to know what the word means. Initially, always start with simple language to teach, avoid using idioms since they generally have a different meaning from the actual meaning. This might confuse the students, hence, using simple terms will clarify the meaning and easy to understand. For Example, hold your horses is an idiom, but the literal meaning is different. Ask your students if they can let you know when you have used the idiom as this will prevent you to using it frequently and other will also learn about it. Don’t be too fast and quick which might make it difficult for students to understand. Use simple words and be very slow while pronouncing it, also, be clear and precise so that the students can understand them. If the student is new or in early levels of teaching then it is good to ensure that they have understood the word and ask them if it is clear with them or require it to be repeated. Initially all the students have the trouble to understand and pronounce the words, therefore, prevent from correcting the students frequently. If they make lots of mistakes then let them do it for a while and once they are comfortable and confident in using the words, then correct them. By pointing out their mistakes frequently they might be feeling a bit overwhelmed and might not be able to discuss their queries later. Use shorter sentences to begin with while teaching. Too long sentences may confuse the students making it difficult to grasp its meaning. Hence, with smaller sentences you can explain the meaning too. For Example, you can start by using fill in the blanks My Name is _______. A basic and simple sentence to being with. Also, you can start by teaching the important sentences of daily use, I am from _____. My hobbies are _____. The daily used sentences will help them to interact with strangers too and will be able to learn English language faster. Starting to learn English grammar is essential for any language to begin with. It is the backbone of every language yet confusing also as, the use of grammar at times is different in different languages. Teach the grammar part later and begin with the spellings, words and their meanings. Writing the language is extremely difficult and boring. Understanding the shape of the alphabet is quite tough initially and one requires immense patience and persistence to do it. Using smaller words and sentences to write is quite helpful to keep the interest maintained throughout the learning process. Fill in the blanks is the best options to encourage the writing for a student as it will also help them to think what word should be put in the blank. One can also start with as simple as the words describing colors as they are easy and quite in use. There are various dictionaries available in the market which can translate the student’s native language into English. Recommend them to get one as this will be helpful for them to learn the words and their meaning. Pay attention to the student and give them some time to read the words in their native language and let they come to you for queries and questions. If there is a new student then the teaching objectives are required to be changed. First of all, understand how far and how much your student has the knowledge of English and his grasping capability to pick up the language. Then plan accordingly what all is required to teach the student. For Example, if you are thinking to teach about the history then you might want to reconsider it as it will be difficult initially for the students to relate to it. Teaching the new students initially is a challenge for the educator itself and sometimes they might lose their cool on it. Therefore, having a positive attitude and faith in your students is of utmost important, especially when you find few of your students might be struggling to learn something despite various attempts. Your positive attitude will be their motivating factor, your faith in them will be beneficial for them to learn without giving on it. Don’t forget to complement your students on their achievements. No matter how small is their achievement it seem saying encouraging words will boost their moral and your students will put more effort into it. For a new student learning a new language is an important milestone and by your support, they will be able to achieve it. Every person likes compliments about something and hence it becomes a point of motivation to do better in that. Group studies are quite effective in the learning process, make a small group of yours and allow them to talk and write in English, let them teach and guide each other. Not only they will become friends of each other, they will also develop a comfort level to learn more and new. Do keep a track of each group, you can also encourage group quiz and reward the best team for maintaining a competitive spirit of learning among everyone. Having a clear vision as to what one require to achieve is quite effective in the learning process. Talk to your students individually, learn what is their main purpose or motive behind learning English as a new language, discuss how they see it achieve it. Make a plan with them and break it down into small goals and explain to them how they can work towards each goal to achieve it. Smaller targets are effective to achieve and it maintains the motivation to learn ahead. Interact with your students as much as you can know them, their family and culture. be a friend to them and also, be a teacher. Your constant interaction will encourage the students to learn and will let you also know the reason if they are not able to pick up the teaching. A teacher’s job never gets over, it goes beyond the classroom door, they require to understand their students requirements and constantly make plans accordingly. Before the beginning of the class itself keep yourself updated if your students might be taking leave for their festivals. This is helpful in keeping the track of their attendance. The more they come to class and participate the more they will learn. If in case you observe that a student is not regular to the class then take an immediate step and talk to them personally to understand if they are having trouble while learning or if there is some other issue that is hindering them in their learning. With so much of technology available around teaching and learning has become quite easy. Ask them to download apps on languages for example, which can translate words from their language to English or try reading something online. Use can also take internet help to teach them, or use their films of native language with English subtitles, as to make it easy for them to understand. You can ask your students to even record their voices in the class while learning and they can use it to revise the class teachings. Using an audio system will be helpful, they can listen to it whenever they are free and as per their convenience too. These audio books have the native language as well as the English language translation. With the help of these audio books, they will get to learn the correct pronunciation too. Because just learning the word is not enough, a right pronunciation makes a huge difference into everything. Every student is unique and is gifted with various skills and talents. As a teacher, this might be a difficult job for you but try to know the strength of each of your students and see if they can use that into their learning. Some might be good learning through visuals and images then encourage them to learn images as their aide and few might be good at learning with audio, therefore, encourage them to use voices to learn. This will not only make your job easier and faster, but they will also learn quickly. Play games and quiz in the class, probably every week it can be done. Teaching and learning should always be fun. Encourage your students to interact and play word games among themselves. Break the monotony in the teaching process, incorporate more and more games into it. This will add not only fun but the students will also remember them. Songs and music are always catchy to ears, hence, try to make a song out of few language as everyone learned in the nursery as nursery rhymes. This small poems are effective in learning and are easy to remember. You can also incorporate poem recital in English within a class, where students can share their own simple poems written in their own way. Prevent correcting their poem in initial phases but encourage them to write more and more as this will develop a lot of confidence and comfort towards the language. Every class has a mix of various kinds of students, some are extroverts and don’t mind asking questions and some are quite shy and introvert and have trouble speaking in class in front of everyone. To such shy students avoid putting them on the spotlight by asking questions in front of everyone. Try talking to them in private and learn their doubts and queries if they have. Provide them sufficient time and space to be able to open up about their questions. Teaching is one of the most fulfilling jobs in the world while it is also a job where a teacher struggles with students to teach them the correct words, but once done they are the first person to be happy about their students achievements. 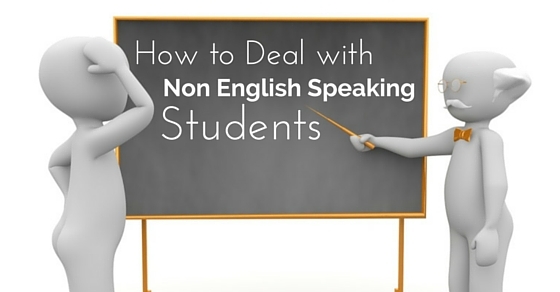 With non-English speaking students, things might be bit difficult since communicating with them initially might be a point of a problem, but this is also a point where it will show your skills as a teacher too.